Pictures of modern speed models by Robin Hiern, multiple record holder and National speed champion in both Australia and Britain. 1. 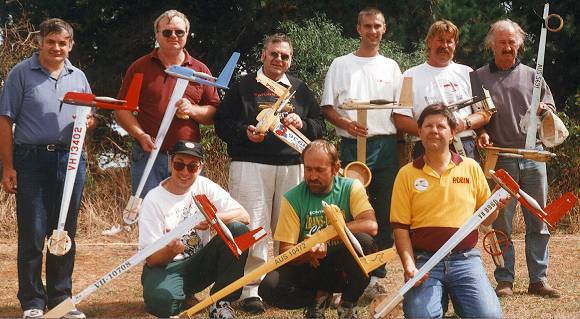 FAI speed competitors at the Victorian State Championships for 1996, held over Easter at the Frankston Field. That's Robin in the yellow shirt at bottom right. 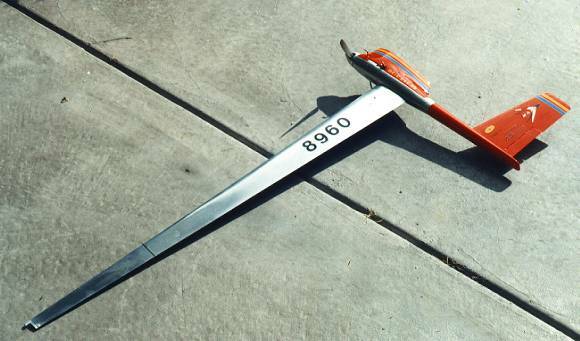 For the benefit of readers not familiar with design trends in control line speed model aircraft, it must be explained that the strange looking gadget each competitor holds is in fact his model aeroplane. 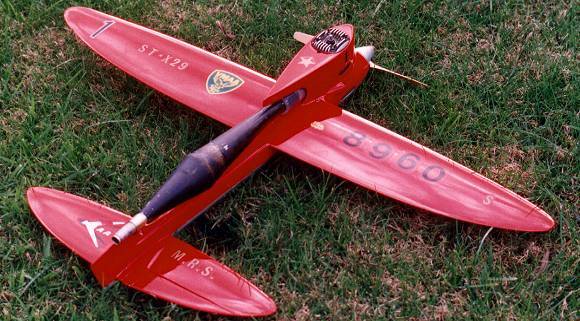 2 Robin's F2A FAI speed model, sitting in its take-off dolly. The plane is powered by an Irvine 15R motor capable of producing around 2 BHP at 34,000 RPM on FAI fuel. Holder of the Australian record of 291 KPH on the old 52 foot lines, and 283 KPH on the new 58 foot lines. 3. 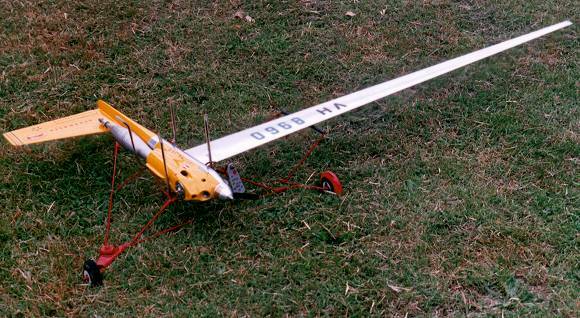 Winner of the 1997 British Nationals speed event was Robin's 2cc speed model, powered by an OS C2 II - PS. It also holds the Australian record of 242 KPH. This is the event Robin is most serious about these days. 4. Robin's Class 2 speed model powered by SuperTigre X29 and flown on monoline is another Australian record holder at 180 MPH or 290 KPH. But for the tuned exhaust pipe emerging from the back of the engine cowl, this model could be mistaken for a speed model of the early 1960's. In those days tuned pipes were a rarity, with wide open exhausts almost universally employed; monoline control was around although seldom mastered, and assymetrical model design rarely even considered. Click on any picture which interests you to see an enlarged version. It was after working for some time at Baron Engines on go-karts that Robin decided to work from home making and selling modelling bits and pieces, fixing up engines and tuning them. In the go-karting world, people with engineering skills such as Greg Smith and Neal McAuley make a lucrative living by blueprinting, modifying, maintaining, and tuning racing engines for their customers. Robin tried doing a similar thing for modelling enthusiasts, and for years had radio control, car, and control line customers from all over Australia and overseas. At last count his engines held 10 Australian records. In 2007 Robin's fleet consisted of 21 speed models all ready to fly. See more of Robin's models here. Contrary to popular belief, Speed is not dead; it's just that you don't hear much about it. In Victoria we have regular competitions on average every 4-5 weeks. I myself mostly fly only Speed these days, with a bit of Stunt, mostly Vintage, but just for fun. In Melbourne there is a control line contest on at least 3 weekends of most months. Numbers are down, as elsewhere: the trouble is that there are too many contest classes for the few fliers active, which means that we usually get only 3 for most racing events. With all its problems I still find control line the best hobby. I have tried others but keep coming back to it. I just like the engine development that control line allows. Developed 2000, revised 2005 by David Kidd. Your Webmaster is Ron Chernich.